So, the question I always pose and answer at the start of every review – would I recommend to a friend? Hell yeah! After some initial itchiness (probably more in my head), the thing was extremely comfortable to wear – so much so that I felt confident about wearing it in the Northburn race, even though I hadn’t trained in it that much. It pretty much acts as a thermal, but the good thing is that you don’t feel overly hot in it when running. I’ve worn it in both warm and cold conditions and it seems to regulate the body temperature very well – I’m yet to wear it in really hot weather though. The model of Icebreaker I bought was the 200 weight long sleeve version. There’s quite a few different varieties and colours you can buy, even a 100 weight short-sleeve which is effectively like a t-shirt. But there’s also 150 and 250 weight versions too. In the cool, when moisture is absorbed from the cool air, merino fibres ‘liberate heat’ through a molecular process called ‘heat of sorption’. Sound a little complicated? Does to me too. I think what the Icebreaker team means to say, is that if it’s good enough for the sheep over in New Zealand (who deal with both hot and cold weather), then it’s sure as hell good enough for us too. Put simply, the merino wool fibres are extremely fine, so that means it breathes more as a garment – which is good enough for me. I’ve yet to try this is top in really warm weather, indeed the highest temps I’ve been in are around 25 degrees celsius, so it would be interesting to try it in the summer months here in Sydney and see how it performs then. There’s also a couple of other things you should know about this top. You can wear it as often as you like, sweat like a pig on heat and the thing won’t stink at all – it’s amazing. A great little gimmick (if you can call it that because it’s actually a really cool little thing), is to type in your unique BAACODE (number inside the top) on the website. From here, you can see exactly where the merino wool that made your top actually comes from. So how’s it looking on the mountain scale? After a touch of deliberation, we’re going to award this a 4. It’s reached the heady heights of CP3, has great potential, but there’s a few things it needs to work on to reach a place on the top of the pile. There’s a new icebreaker top with collar and zip that I’ve just taken out for a road test, so maybe that will hit the 5 we think it has potential for. Hi , I can share my experience: I wear icebraker shirts, leggins, and underwear since 3 years for nearly all sportactivities : cross country skiing, backpacking, cycling in winter, running , and rowing in winter and summer. I must say its the most comfortable shirt I ever have worn and it des not stink. The only exception is running in very hot summers here ( italy , high umidity etc) there I use sometimes some synthetic. But still now, end of april, i wear only icebreaker shirts or later tanks for running. I wore 2 layers in the 2011 TNF100…a long sleeve Rib (160 Grams per sq meter GSM)THE softest top ive found and a short wool T over the top….with a 260GSM jacket over the top of all that for the night section(at 3 degrees)plus wool leggings over compression tights….all worked great…cant reccommend it enough. I’ve tried Icebreaker and not sure what all the fuss is about. I find merino tops scratchy, while Icebreaker socks are great, but shrinkage is a big problem after washing. 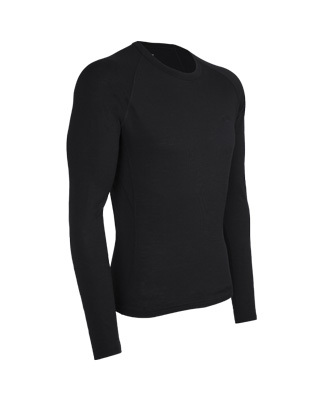 For the price, I’m more than happy with synthetic wicking tops, and wool blend socks. Way cheaper, much better value for money and minimal shrinkage.